Select an option... Booth : I will prepare tables & chairs for the guests to sit with the artist(s). Roving : I don’t have extra tables & chairs. Please have the artist(s) wear work apron(s) and walkabout. 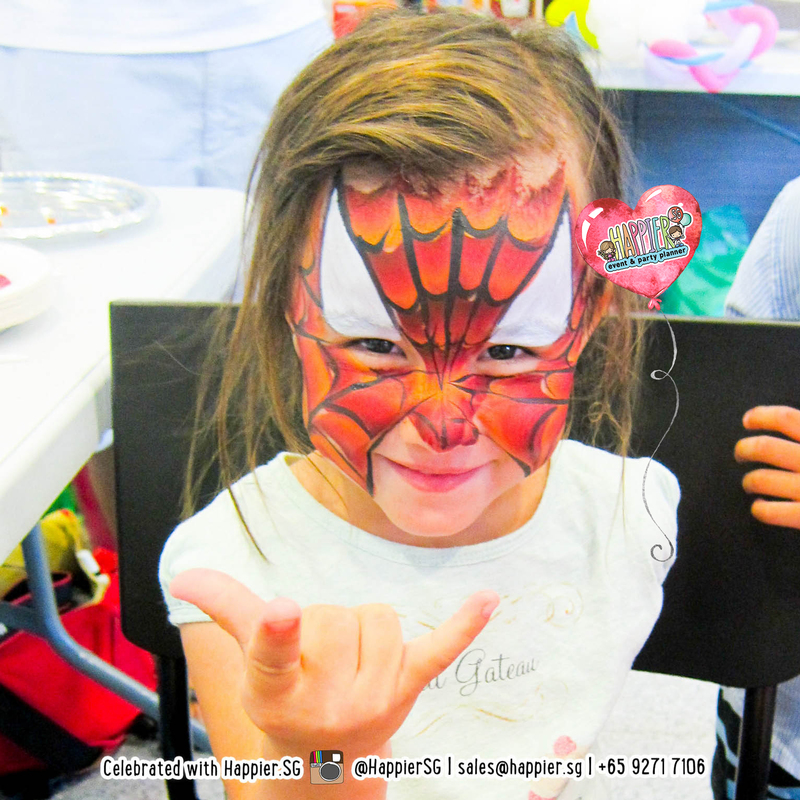 Face painting is a great source of entertainment, kids and even adults can’t resist on getting in on the fun! 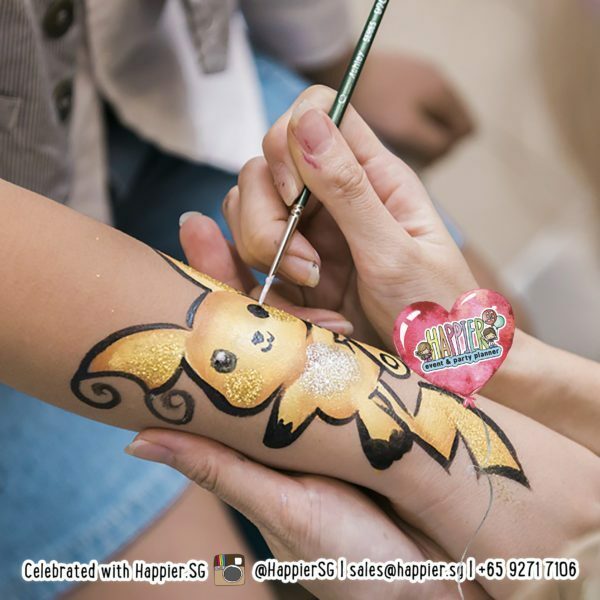 Our friendly team of professional face painters are happy to paint on your arms if you can’t get enough of our attractive designs. 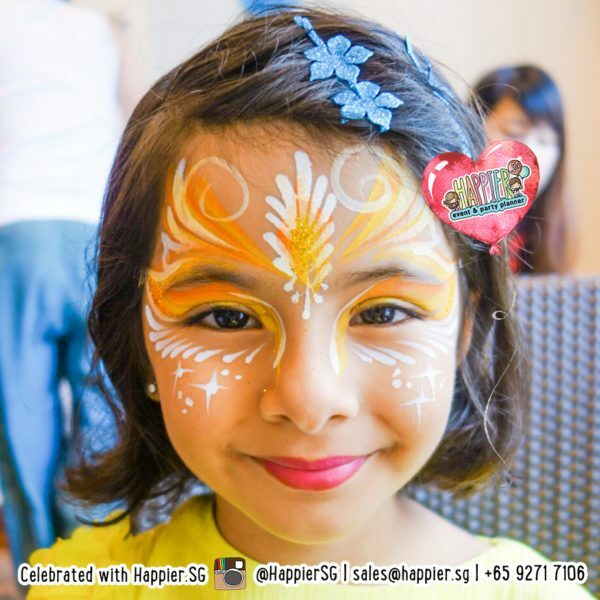 Face painting is guaranteed to create smiles, memories that will last a lifetime, and the chance to be what ever you want to be. 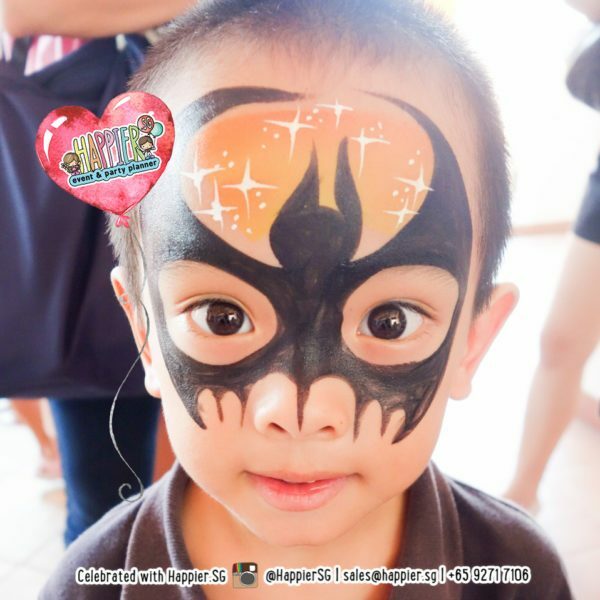 Let us make some face paint magic happen at your event! 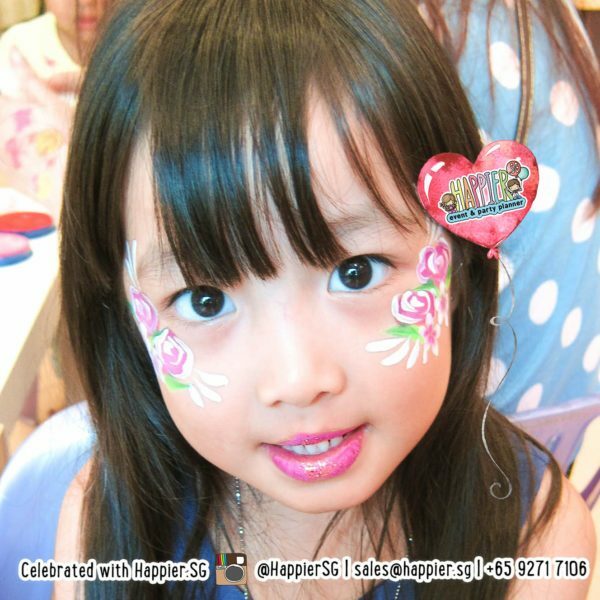 Our playful face paint is ideal for parties with more than 12 kids where you will appreciate a faster turn around time. 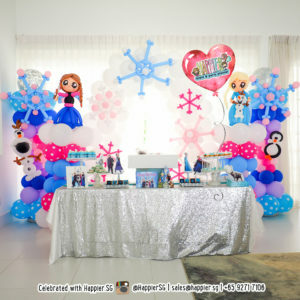 Keeping the designs fun and simple also help us stick to the party schedule you have planned. 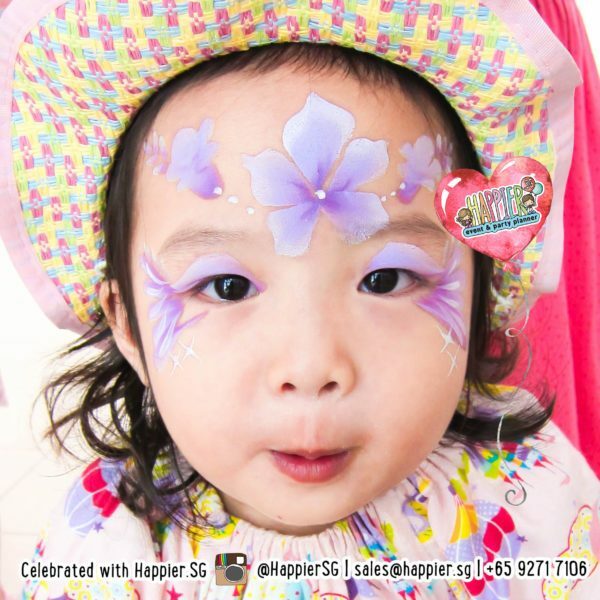 Playful face painting includes small flowers, butterflies, spiders, hearts, rainbows & snowflakes on the cheek or arms. The number of children is not a hard and fast rule for us. If it’s end time and there is still 1 more child left, we will gladly oblige to see that happy smile. 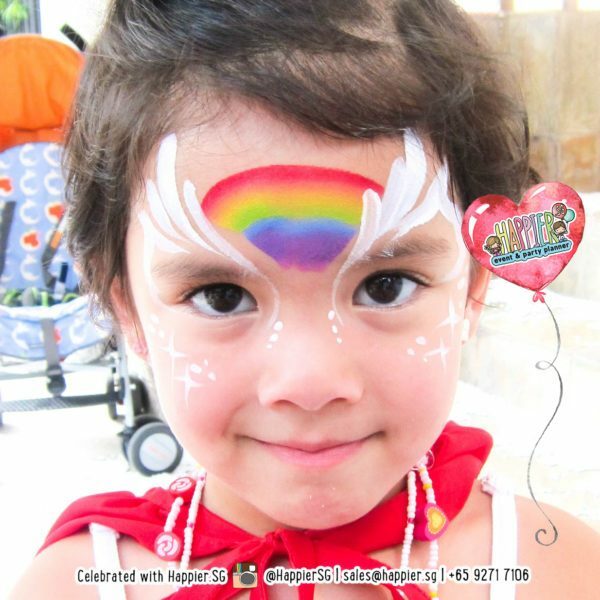 Our elaborate face paint is ideal for more intimate party settings where we can afford to fascinate each guest. At parties, we aim to not just to paint, but also to entertain! 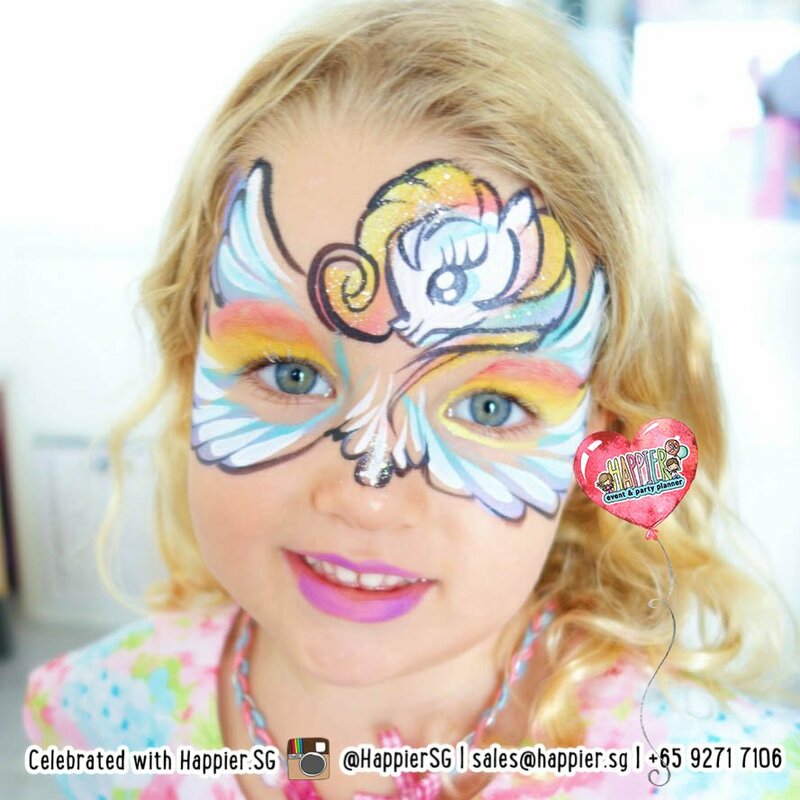 So if you’d like our face painter to spend a bit of time engaging the child in stories of their favourite superhero, princess, pony or turning them into their favourite animal or full face butterfly, you can expect to cover about 8 to 12 kids per hour. 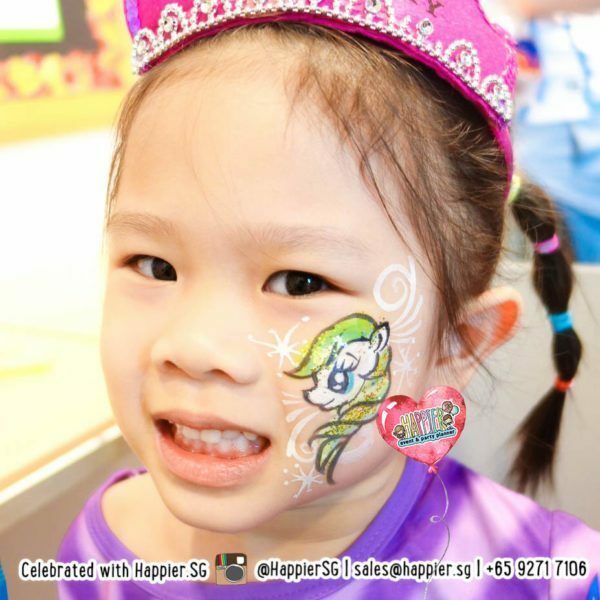 If you wish for our face painter to offer both types of face painting at your party, you might be happy to know that we do entertain on-the-spot extension purchases should our party schedule for the day permit. 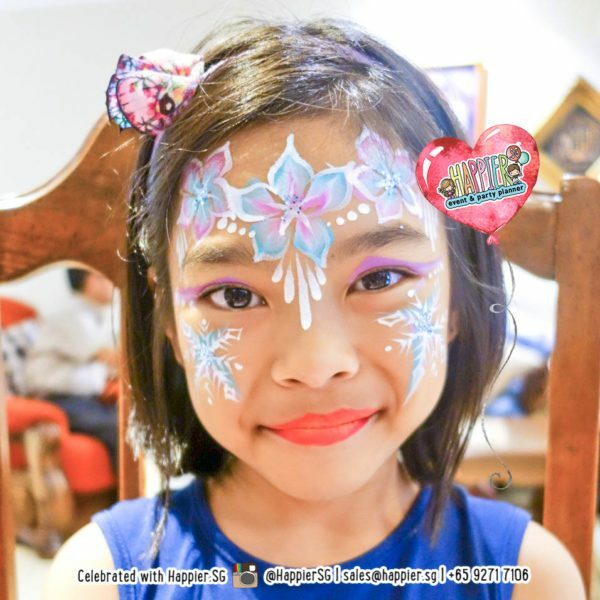 It is quite likely most of your guests will be asking for our elaborate designs the moment they lay their eyes on our cute face paintings! 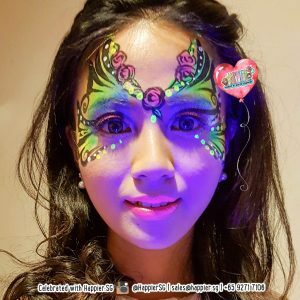 For corporate dinners & social night events, you can consider our speciality glow in the dark UV face painting as well! Is your face paint normal water color? (3) dries fast and smudge-proof. How do you charge for face painting? Our artists are hired on an hourly basis with minimum 1 hour booking per trip. On the spot extensions are subject to artist availability. Our weekend schedule tends to be very tight so do consult us on the right duration to book if you are not sure. 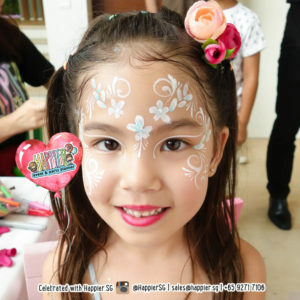 What age range is your face painting suited for? Our face and body paints are FDA certified and hypoallergenic. We paint at least 50 kids every weekend from ages 2 and up. None of the parents have reported any allergic reactions to date. However, if your child has existing wounds, rashes, flaky / sensitive skin, our artists will not be able to oblige a painting. Not only to protect your child, but also for the hygiene of the other children who are coming under our paint brushes. 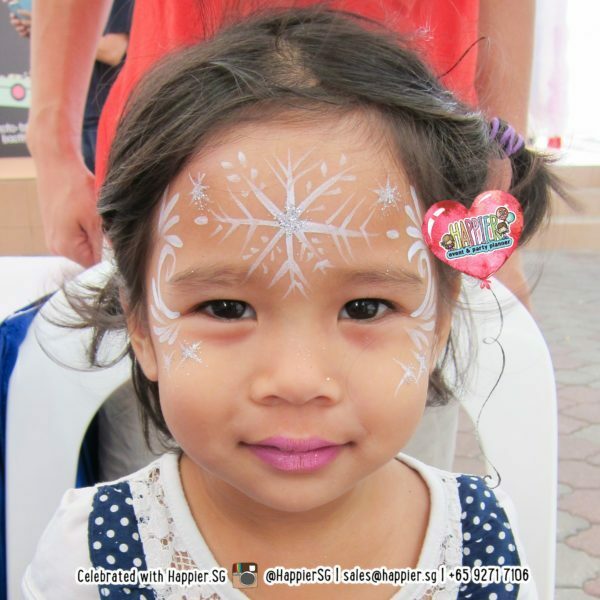 What can I expect for face painting on children under the age of 3? At this age, fun to a toddler is made up of novel sensations, happy sounds and bright colours. This means playful designs will work best. They are quick to paint will ensure the experience is most enjoyable to him / her. It also helps for mums and dads to have their toddler sit in their laps if they are aged 2 and below. 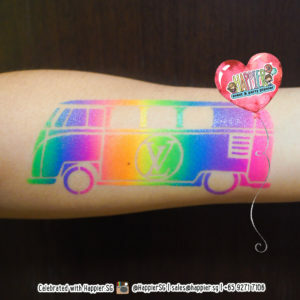 When you echo our artists with your “Ooooh!”, “Wheeeee!”, “You look amazing!”, we guarantee your toddler is going to love getting painted even more. It doesn’t matter if he or she sweats off the painting in no time, what matters is funny feeling of being painted and looking super cute for mummy and daddy to take lots of photos with! What can I expect for face painting on children above the age of 4? At this age, your child is usually smarter than you think. They can be really specific about what they want. 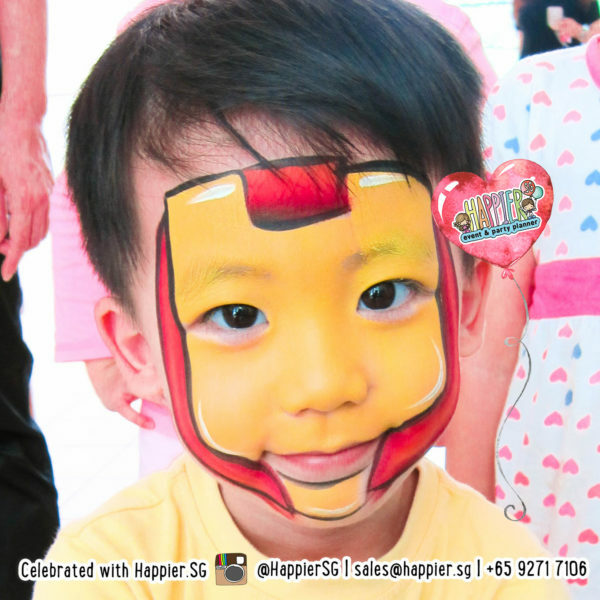 We try to let our face paintings be driven by your child’s imagination. If he wants a Rainbow Spiderman, he gets a Rainbow Spiderman. If she wants something we’ve never heard before, just do a quick google on your smartphones and show it to us! We’ll try to paint anything! Just remember to cater more time so we can afford to entertain their special requests. Do your face painters entertain adults too? Oh yes! Our favourite kind of children are those young at heart! We would love to paint a butterfly for Granny if she’s sporting enough. Or an Olaf who dances when Dad wriggles his nose! The kids go crazy when the adults get painted too. Our experienced artists are also highly sought after for adult private face and body paint makeup appointments. Our artwork for private appointments tend to extend slightly into makeup artistry due to the precision and technicalities involved. Private appointment designs can take up to 15 min to 1 hour per pax so they are not the typical designs we offer at parties. 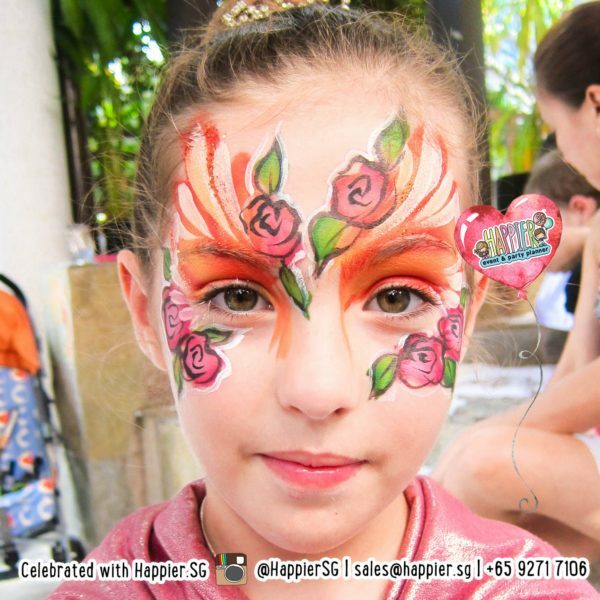 What kind of events can your face painters do? 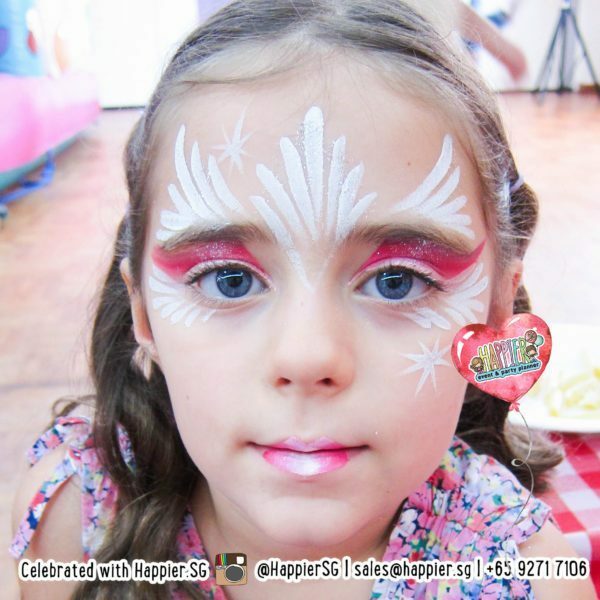 We provide party face painting services for birthday parties, hens parties, baby showers, corporate events & glow in the dark parties. 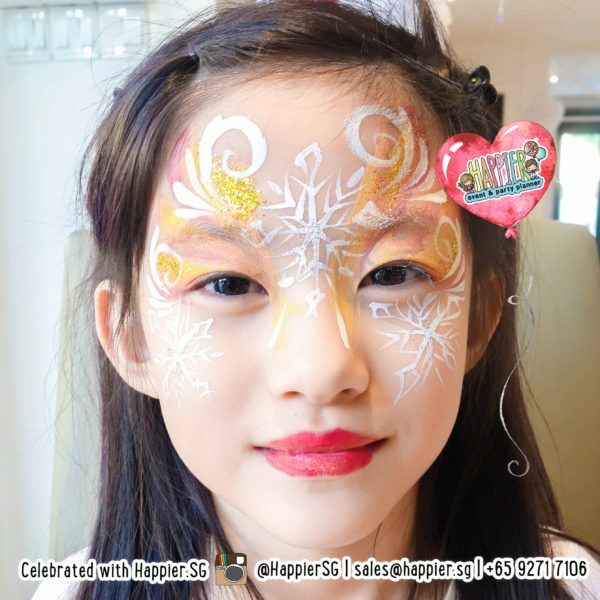 We also have a select pool of high mastery face painters who provide makeup services on private appointment basis to transform you for your special occasion! Can you do my halloween makeup? Check out our halloween face paint makeup services! We have a select pool of high mastery face painters who are available for hire on private appointment basis. Remember to book your face painter early as we are extremely busy during the halloween season. Can your face painters paint on the legs or thighs? You’d be surprised that we’ve ever gotten such requests! When at parties, we only paint on faces, neck and arms for hygiene and other sensitivity reasons. Can your face painters dress up? 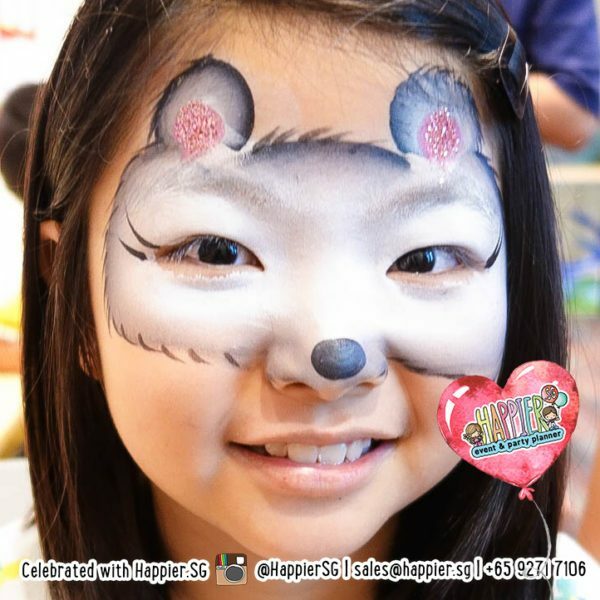 Our face painters will come in kids-friendly happy-looking clothes for standard bookings. 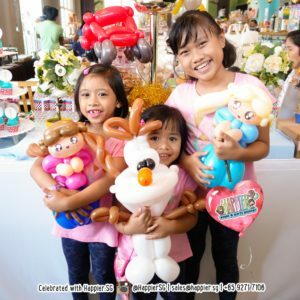 We also have dedicated male and female artists who have both the personality and face painting skills to pull off a superhero, princess or mermaid party if you happen to be planning one. What do I need to prepare for face painting? Please set aside 1 table and 2 chairs for your face painting booth. If you have a few more chairs to spare, you can even let 3 to 4 kids be seated around your face painter so that they can watch in comfort. How long in advance do we have to book your face painting? Popular entertainers often have a pool of repeat customers to serve so it is always wise to give yourself AT LEAST 2 weeks especially if you are booking us for the first time. We confirm bookings on first come first serve basis upon full payment. 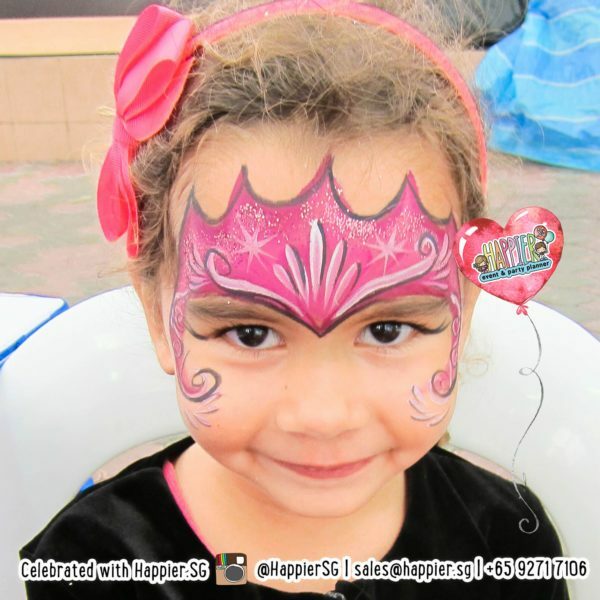 What if I have yet to finalise my party but I am really keen to book your face painter? We understand it might take some time to secure your party venue and RSVPs. Please let our party planners know in the comments section before checking out and we will see what we can do to help! 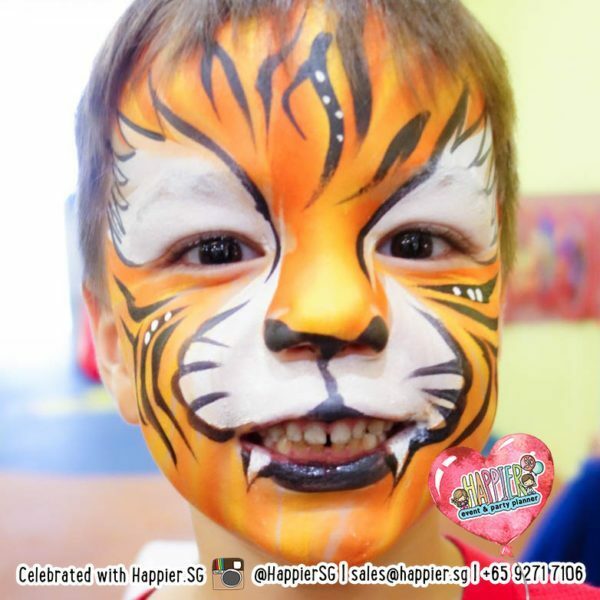 Hiring a face painting booth at your event creates an irresistible draw for children, teenagers & parents alike! 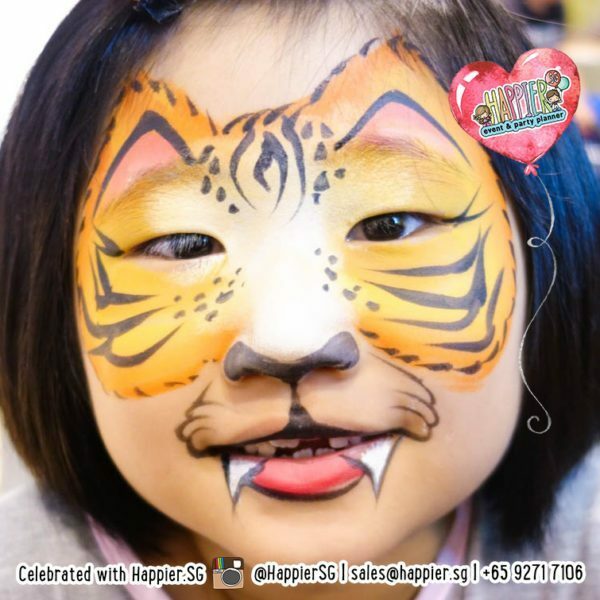 Our talented face painters are known to be best at creating fast and fun designs with their incredible face & body art skill. Who says money can’t buy happiness? 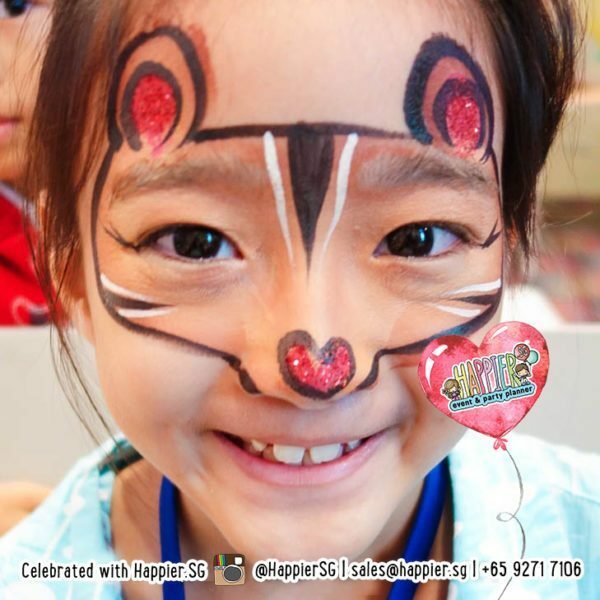 Hiring our face painter will be one of the cheapest deals you’ll find in Singapore for endless smiles and unforgettable memories at your next party! 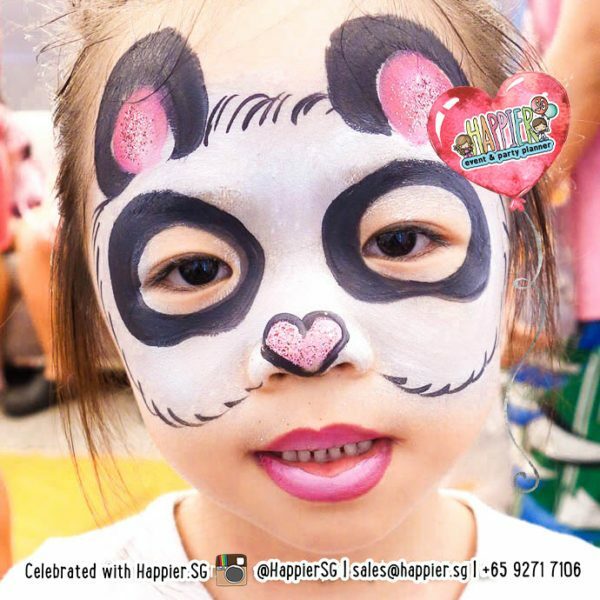 Our playful face paint service is best suited for corporate family day events, school carnivals, roadshows, community events and larger kids birthday parties where you will expect more than 12 guests over the hour. Our lightning fast yet colorful face paint designs will hit a spot with your larger crowds, keeping the wait time with our playful face painters under 3 mins per guest. 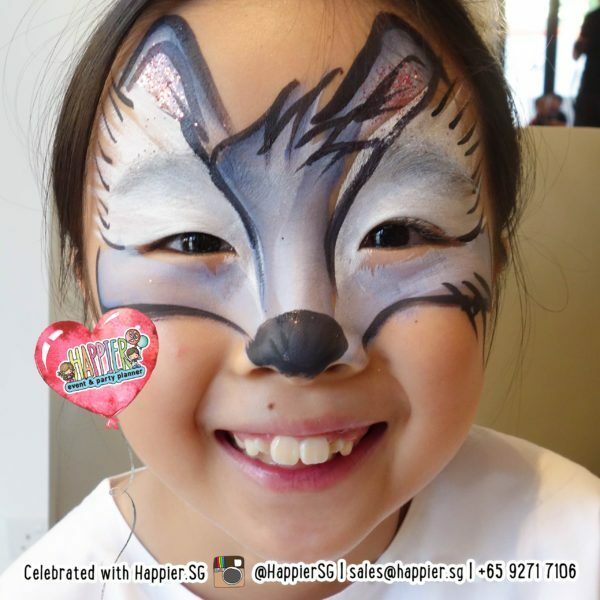 Keeping the designs fun and light will allow your event to run smoothly while letting as many guests get in on the face painting fun. 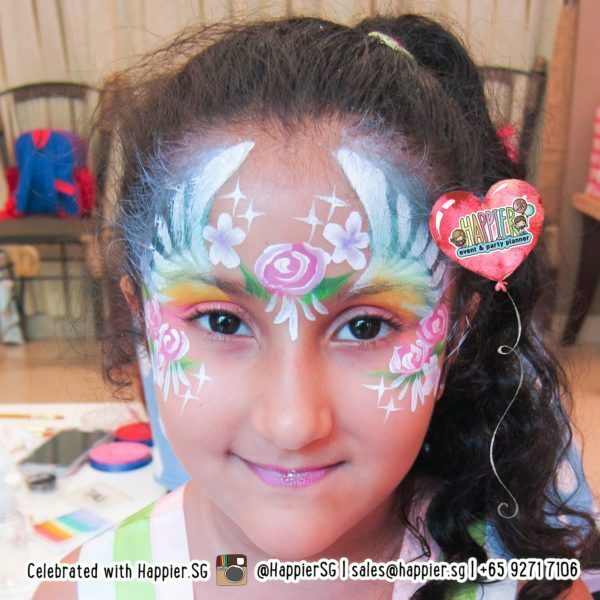 Our artists typically work off a fixed catalog of face paint designs for such events to ensure that we manage the requests well within your allocated schedule. 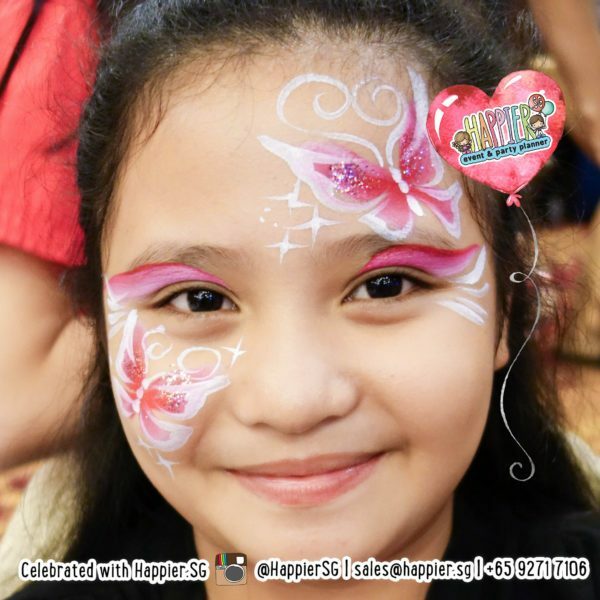 Our elaborate face paint service on the other hand, is an ideal entertainment choice for corporate D&Ds, luxury events and premium kids birthday parties in Singapore. 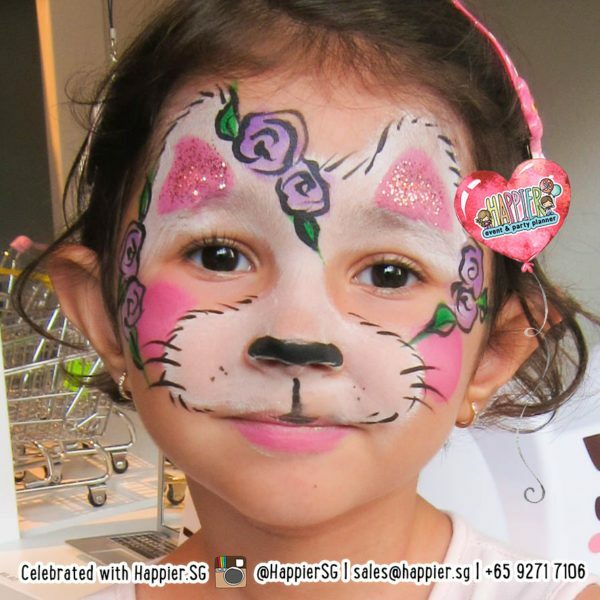 If you would like our professional face painters to focus on a smaller and more exclusive guest list, you’ll truly enjoy the full range of our artistic ability. 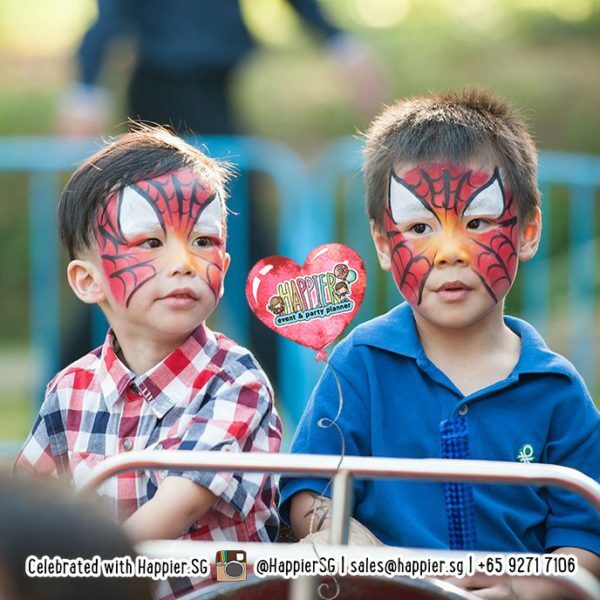 Our elaborate face painting is delivered in a more personalised setting, where every guest feels special and proud to flaunt their face and body art the moment they step out of our booth. 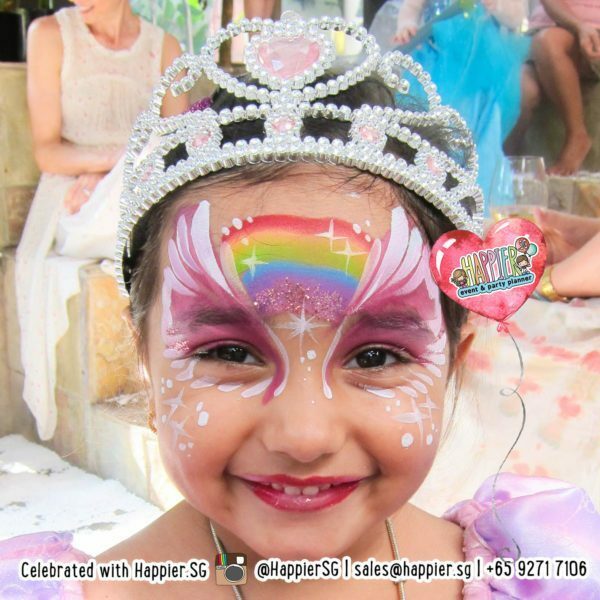 Let your child call the shots on all the details of their character face painting or spend some time picking out their favourite glitters & colors. 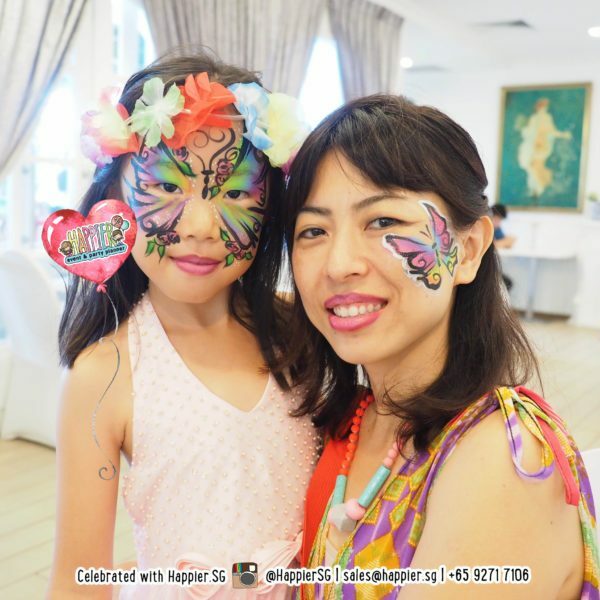 Our elaborate face painting becomes an engaging and entertaining creative journey to be experienced by the guest being painted as well as those who are watching. 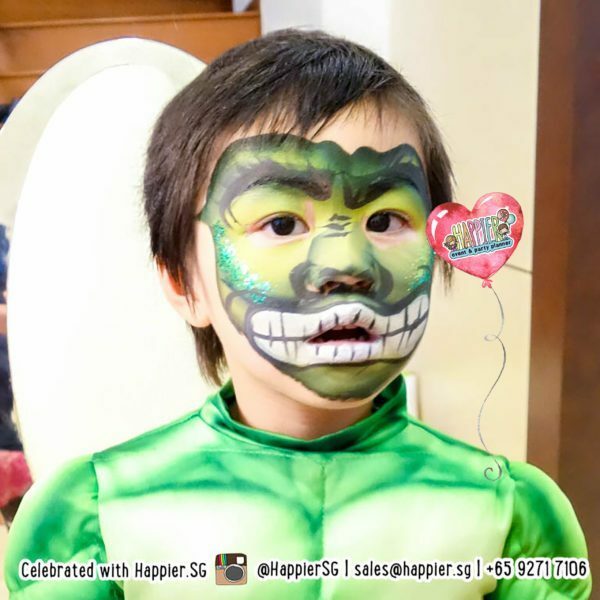 Hiring multiple face painters to deliver elaborate face painting can be an option if you have larger crowds but still desire to have our talented artists work their magic. Our elaborate face painters typically take anything between 5 to 10 minutes per pax, keeping the request of every guest as the key focus in our service delivery. 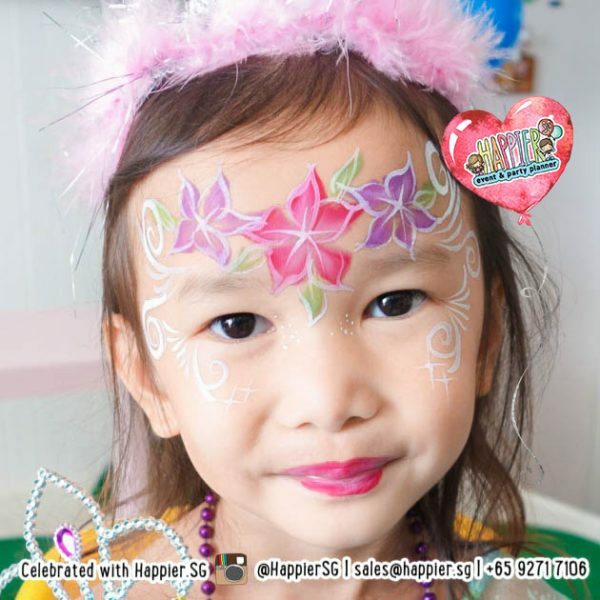 We use only the best face and body paints that are non-toxic and hypoallergenic. 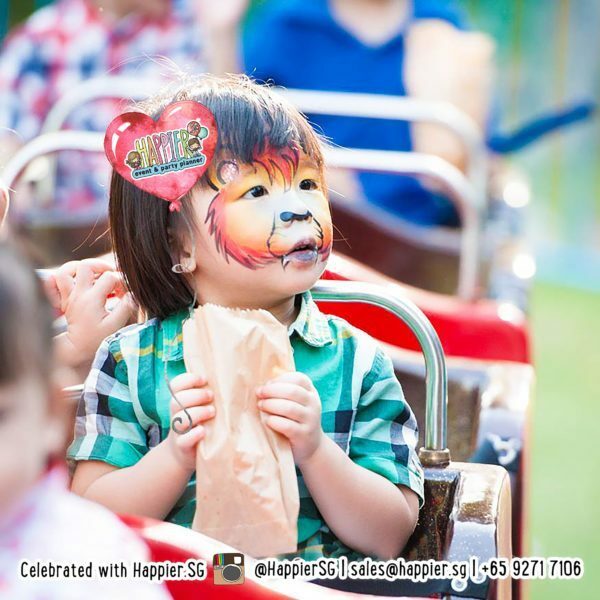 It’s perfectly fine if some face paint is accidentally licked off, making it perfectly safe for a curious child to indulge in this colorful sensory experience too. Even if it is just for a few hours, face painting allows everyone to be whoever or whatever they want to be. Become a superhero, princess, movie character or let your imagination run wild with animal prints. 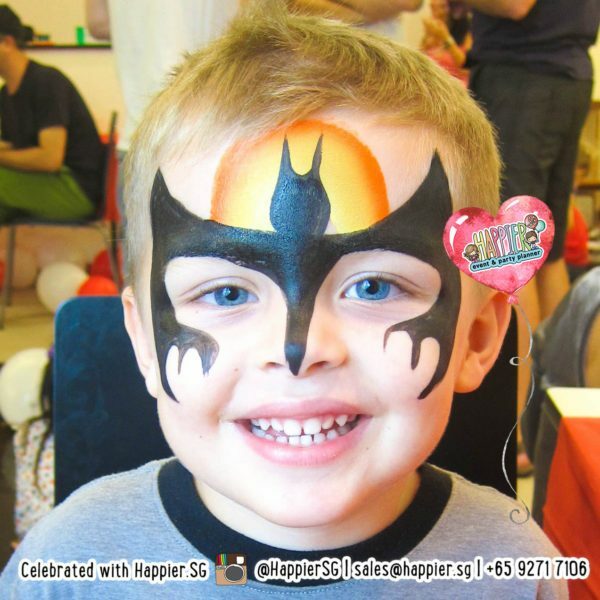 Face painting always creates an unforgettable party experience and awesome photo opportunities with family and friends. 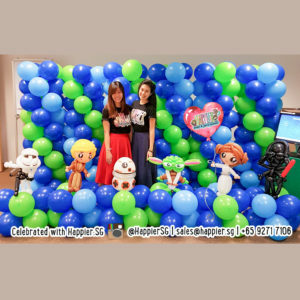 Get ready to bring some candour, fun and laughter to your next baby shower, hen’s party, corporate celebration or even glow in the dark event with some of Singapore’s most highly sought face & body painters!